The name ‘Defenseman’ or ‘Defender ’used to be an accurate title but no longer properly captures the role of the modern Hockey ‘Defenseman’. Now we ask our players to “Attack as five and defend as five” and our defensemen to be our ‘Quarterbacks’ – playing with poise, vision, and awareness. So, how do players see the ice and make decisions? We need to teach this. Repetition is key for neurological change and developing these skills so players are able “to do” without thinking – good skills practices build confidence. Drills should try to simulate game-like scenarios and teach how to read and decide the best option in all zones including two on ones, one on ones, shooting, first passes, regroups, and stretch passes. Once individual and partner skills are introduced, the entire team can be included in the drill. The neutral zone regroup is a situation that calls on the ‘Quarterbacks’ to transition from a defensive mindset to an offense mindset. This provides a great game situation opportunity that happens countless times per game at all levels and ages. F1 passes to far D (D1); D1 hinges towards middle of ice and passes to D2 ; F1 supports the puck by skating towards the defensemen and performs an open pivot (facing D2) for a stretch pass up boards. F2 passes to near D (D2); D1 hinges away and passes to D1; F2 mirrors path of puck and provides middle lane support; D1 passes to F2. F3 passes to far D (D1); D1 hinges away towards far boards; to change the flow of play, D1 ‘throws the puck’ to D2 who has hinged underneath D1 in middle of the ice to provide a support option; F3 Wing Support. Mom, what team will I play for next season? 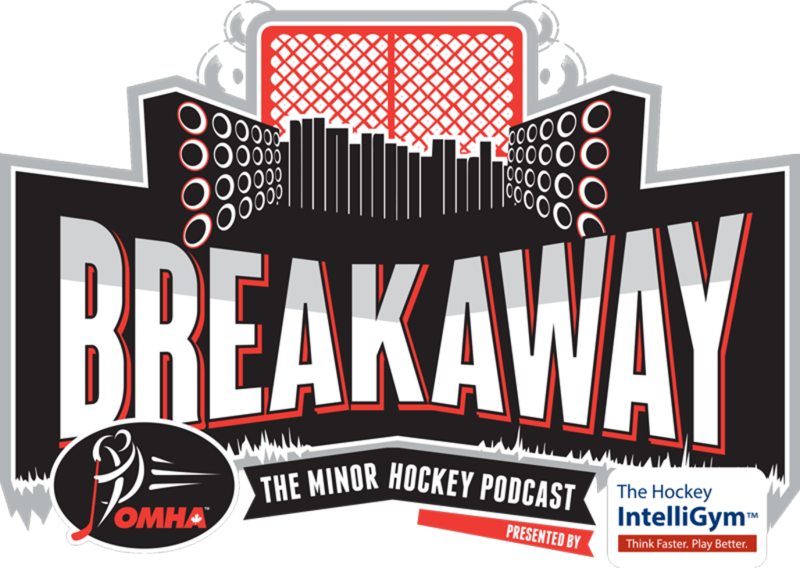 Breakaway, the minor hockey podcast puts you in alone with some of the best and brightest minds in the game today. Each week, Dan Pollard sits down with the leaders of hockey to discuss everything from scoring more goals to how to grow the game. Subscribe to the Breakaway, The Minor Hockey Podcast on iTunes, Stitcher, PlayerFM, SoundCloud or wherever you consume your podcasts. Defensemen should be in constant motion and Forwards start each time the Defensemen transition to backwards skating and show they are ready to receive the puck. Once players are executing comfortably, apply pressure to create a ‘controlled’ competitive environment.